The OnePlus 2 is still quite difficult to purchase, even though they claimed it would be easier than the original OnePlus One. Sure, there are more invites on the market, but the device is still only available by getting an invite from OnePlus, from a friend, or a nice fella on the internet. That is about to change for a limited time. 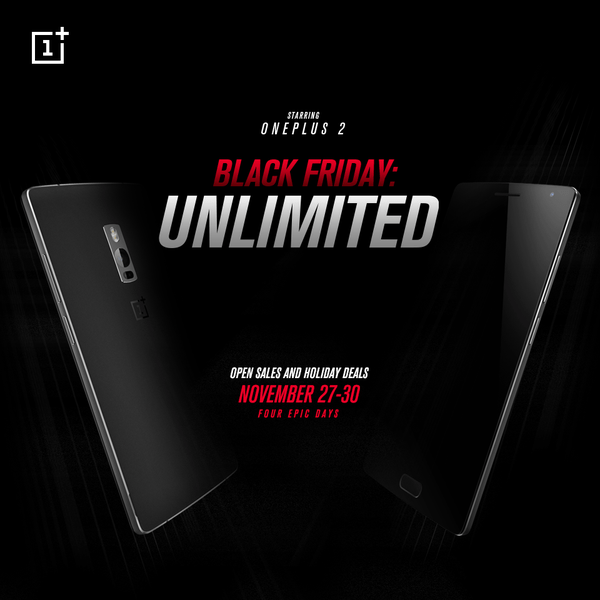 According to OnePlus’s Twitter feed, the OnePlus 2 will be available to purchase invite free starting on Black Friday and ending on Cyber Monday (November 27-30th). The flyer also states there will be ‘Holiday Sales’, but it is unknown what they will be. One could safely assume it will deal with all of OnePlus’s in-house accessories, such as USB Type-C cables, StyleSwap covers, and cases. To catch you back up to speed, the OnePlus 2 runs $389 for 64 GB storage, 4 GB of RAM model, whereas the cheaper version with 16 GB of storage and 3 GB of RAM is $329. We reviewed it earlier this year and think its a worthy competitor in 2015, but isn’t the 2016 Flagship Killer OnePlus claimed it to be. Will you be picking up the OnePlus 2 this weekend?